Not all yaks have to be secret anymore. Yik Yak, a location-based network popular at high schools and colleges, has added a feature that breaks its tradition of anonymity. Yik Yak launched in 2013 as an app-only social network allowing anyone to anonymously post to feeds based on their location. Posts, called "yaks," within a five-mile radius appear on a user's phone. The user can then choose to reply or upvote these posts and post their own. It has gained traction at schools, where people use it to share tips for classes or news on upcoming campus events. Starting Tuesday, the app will prompt users to choose a handle the next time they post a yak or reply. Until they claim one, users will be able only to view and vote on yaks. All handles must be between three and 20 characters and abide by Yik Yak’s terms of service, which forbid racially or ethnically offensive terms, and language that is obscene, threatening or demeaning to an individual. 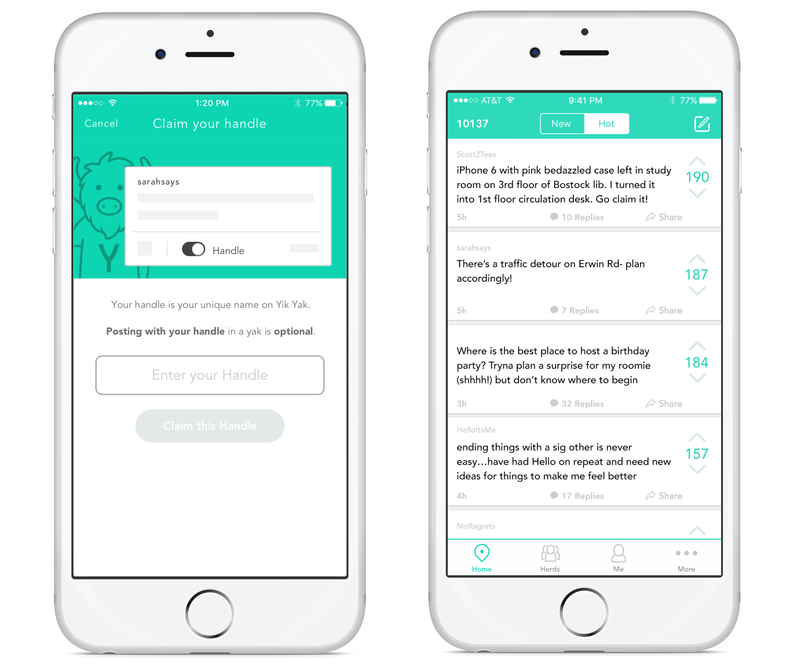 Yik Yak users will be prompted to create a handle the next time they open the app. Whether it appears is optional. Photo: Yik Yak Despite its foundation in anonymous messaging and basically no sign-up process, Yik Yak has made several changes over the past two years that let users take more ownership of their identity. For example, the app introduced reply icons last year. “Before, it could be the same person, one person replying to themselves 15 different times,” co-founder and Chief Operating Officer Brooks Buffington told International Business Times. As an anonymous network, Yik Yak had a spam problem and gained a reputation for bullying, hate speech and campus threats. Some colleges, including Utica College and the College of Idaho, pushed for a ban of Yik Yak last year. One competing anonymous app, Secret, was shut down by its own CEO in the face of its abuse. But the addition of identity features like reply icons has cut the level of spam and abuse on the network, the founders say. Indeed, over the years, Yik Yak has seen both a need and a desire for handles. At various schools, they will see professors tag their posts and reply to students. There are also “weatherman characters” who post morning weather reports and tips on what to wear. Yik Yak operates on more than 2,000 college campuses in the U.S., UK and Canada, and has hundreds of campus representatives who have gathered feedback on adding features. 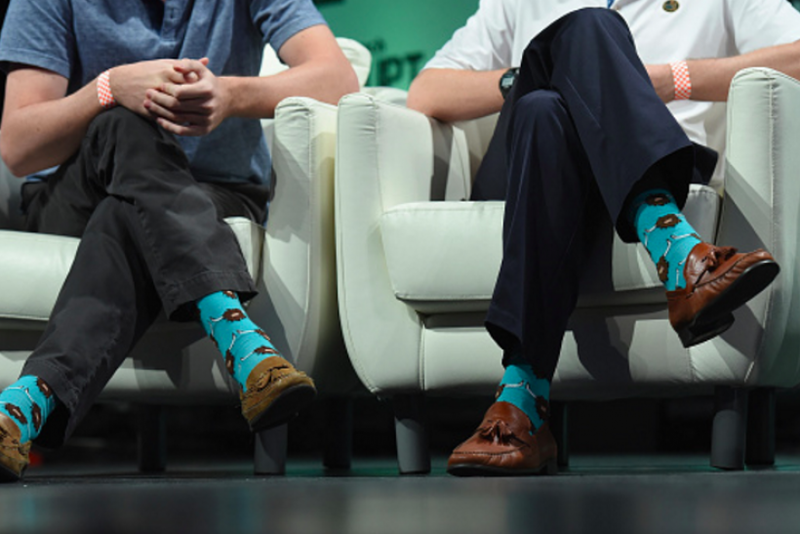 Yik Yak is supported by $73.5 million in venture capital funding. It closed a Series B financing round of $62 million in November 2014, led by Sequoia Capital.